end of July closes not only activities season of spring and summer but it is also an opportunity to wrap up the first part of the year before taking the leap in to the second part. 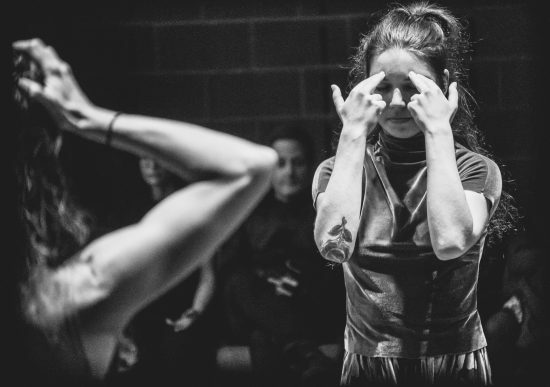 Along those lines is then the following talk with New York based, originally from Antibes, France, dance practitioner & choreographer Daria Faïn, that took place during last months, gradually taking its final shape. I participated in her Coremotion Program in January 2018, as part of the Movement Research Winter Program. Daria’s practice resonated with my own dance meditations on multiple levels so I was more then curious to found out more about her work and its structural terminology. Situated at the very beginning of the year, Daria described her sessions as focused on contemplative action as a guided exploration of the correlation between organs, emotions, sensory perception, energy and intellect. The intensity and the profoundness of the five days of practice opened a multitude of themes gathered around the topic of strengthening the fluidity of the body but also of the mind, touching upon some core issues of the human in general. The bridge between movement as a dance practice and movement as a life practice became strongly apparent and relevant, as there was an alternative entering point to the artistic validity that is anchored in the validity of the body spectrum as such. I would like to thank Daria for that extraordinary week and for this further illuminating talk. We were firmly anchored in the detailed body practice as an entering point in to your work. What is, in that sense, the embarking point of the body for you? It is often like a dive into water. As you jump, there is suspension, a vacuum, you then orient yourself, enter the water, feel the temperature and work with the breath. You open into seeing and, in a way, this all happens at once. As you continue diving, you notice more and more details of the process. I really value what is completely immediate in the experience of movement and the rationalization of what happens as a simultaneous process ­­­­– the polyrhythm of the experience of being in action. The body is really an experiential instrument, but movement is not about the body; for me it is about how we fall into the cosmology of our lives. Everything contains movement, and this is what makes me move. Everything contains a space or a need for space and that’s why there is movement. Is there a specific aspect of the physicality of the body, regarding your own body? Both of these quotes imply a process of working out your intention with what you have. Within these understandings, I would also add that, for me personally, it is about freeing potential – sometimes you need to do this and sometimes you need to do that. It is mainly listening to what you need and perhaps not what you want. It is dealing with what is there. There is a form of agency that takes place when you are in action, which, in a way, manifests as a void between our intention and our experience ­– it happens at once within the void, the reality of the moment and responsiveness. Please understand that I am not saying that one needs to be blank. Imagine that you need to express anger or sadness – there is a difference between feeling these emotions and expressing them. You learn from feeling them, then you go through a process of letting them move you. It’s as if you allow the self to empty for the feeling to fill that emptiness. I call this the vulnerable empty pivot. On one afternoon, as we were just starting with the session, you were describing the frontier of the everyday body practice as a way of surviving the edges of life; the edges of the city and the edges of artistic profession. What you said resonated profoundly with me. There are different strategies for living in a city like New York and persisting with one’s work. If I didn’t have my practice, I probably would not have survived this long in this city. I need to recharge myself, physically, emotionally, energetically, intellectually and spiritually. Otherwise, I am literally not functional. In my teaching I also acknowledge how life in the city, and also life as an artist, can eat you up without you even noticing it. Then your life starts to deteriorate. Waking up, finding where you are in all of these dimensions by taking time for yourself is really simple and necessary in order to be more available for what’s to come – it’s practical. I feel it is probably the only part of my life that is actually practical. Your choreographic practice is wide and diverse, including many different areas: poetry, architecture, social practices, health; all under the idea of the Prosodic Body. When and how did those different strings of activities made sense for you, what was the rhythm of that wide field emerging? Western cultures tend to suppress and compartmentalize the understanding of the human being in the universe. Therefore, knowledge is also generated and consumed that way. I left school when I was 16 years old, so I really had to make my own education. As I was studying theater and dance, I had to dig into the different origins of these arts from various cultures and eras of history, and all has contributed to their existences. The interdependence of sciences, arts, politics, economy and spirituality was often cultivated as a way to innovate and expand the understanding of humanity. It is inevitably interdependent whether we are conscious of it or not. I always have suffered from how society compartmentalizes everything; this is why I work the way I do. The Prosodic Body is a field of research collaboratively founded with architect-poet Robert Kocik. Different aspects of our living organism connect to different aspects of our environment and require different attentions all centralized by something un-namable, still and empty. The Prosodic Body is a way to see how this manifests as language. In the realm of the mind and space it is our way of bringing about responsiveness within and without. Everything is language in the context of the Prosodic Body. It is an empiric attempt to listen to what we cannot hear. When someone speaks, you sense so many things beyond what is said, and the listening forms what is said as well. I see language as a way to go beyond what is, while in no way defining something as what it seems to be or what it is believed to be. It is a thought container. In the same way, I see movement as language and a container for energy made of the many aspects of our living organism. I love thinking of Helen Keller who said that before learning words she couldn’t know that the moon existed – I see language as a way to open our mind to our being. And since we are living in buildings and we are subjected to the economy, why not try to understand how all we do is part of a global ecology. You studied at the Graham School in New York City from 1984 to1986 – very interesting period for being in New York. What was it like to be in the New York City then? And what was your experience of the Graham School and its legacy; what did you take with you from that process? The Graham experience was a paradox. I was coming from India in 1982 to perform at the Chateaux-Vallon’s International Dance Festival in France. It was a total disaster. I really had no idea what I was doing – I was so devastated after the performance that I wandered all night and slept on a beach. In the morning I swam very far and I remember that feeling of just having my head popping out of the water and crying in the middle of the sea. Anyway, the day after, I saw the Graham company rehearsing in this amphitheater in full sun and the sea in the background, it was unreal – a very strange time loop. I saw a form of synthesis of all my studies at once and decided to go and study at the Graham School. The synthesis between Asian influence, Greek tragedy and the American pioneer spirit was a magical triangle for me. Funny enough, earlier on when I was fourteen in 1970’s Paris, I was living in the same building as the Centre Culturel du Marais. There I was able to see performances by Douglas Dunn, Lucinda Childs, Bob Wilson and John D’arcangelo. I took workshops with all of them while regularly studying Baratha Natyam (South Indian classical dance) with Amala Devi. I also studied Cunningham technique at the American Center. I was beginning to do my work, mostly solos. So it was a paradox to decide to go to the Graham School since I was so engrossed with postmodernism and experimental performances. Most of my French dancer/choreographer friends were going to study at the Cunningham School – I loved Cunningham but thought that with Graham there was less of a danger of being stylistically stigmatized because it was already placed in the past. It was an extraordinary experience. I was spending most of my days at the school and at the Lincoln Center Performing Arts Library. I was also working with Fiona Templeton and performing for her in experimental downtown venues. The contrast was wild! I also took somatic classes with Nancy Topf and Elaine Summers. After I badly hurt my back I began the Alexander Technique with Ann Rodiger very seriously. I would also go and watch Cunningham teaching – it was so beautiful to see him teach. While studying the Graham technique and pretty much the entire evolution of American contemporary dance through performances and at the Performing Art Library, I would experience it as movement in my body, how it evolved and could move though the principles of the choreographers/performers – I was living a dance archeology. Graham made a deep impression on me. I had the chance to have three classes with her when she was 93. She was such an intense person, she actually screamed at me in the lobby because I wasn’t wearing any shoes – it was an insurance issue! Ten years later I dreamed of her: she was massaging my belly telling me to let it go while she was teaching a class for one hundred people! I literally felt that I had to let go of my own eyebrows if I wanted to embody fully her movement when I was taking repertoire! Your dance practice journey also includes five years of studying Indian dance in Paris with Amala Devi and in Madras with Swarnamuckie – who was a State dancer of Tamil Nadu, working with butoh-based artist Min Tanaka and studying Martial Arts with Master Allen Frank. So quite a thorough process that embraces diverse profiles accumulating in the two decades of body practice. What would be your advice to young dancers? Strangely, I feel lucky that in France there was almost nothing interesting for me when I was a very young dancer because I had to find ways that were outside the frame. It was a very solitary journey and, honestly, for the longest time people didn’t really get why or how I was operating. That solitary journey made me ask a lot of questions, and I had to work by myself to find answers. I always looked for what fed my being not my dancing. All my teachers challenged me as a person, and this is how my dancing and my way of seeing dance and performance evolved. Min Tanaka was such a huge revelation in the way he worked; there were no hours and limits were pushed constantly and in every way. My first Tai Chi teacher Karfung Wu told me to practice outside every day imitating nature. Only after one year did she begin to teach me. On some occasions I used to regret not having a diploma. It would have helped me make a living teaching much earlier in a university. I think things have changed now, and it seems that there are really great teachers in universities, but, at the end of the day, an artist is going to have a unique journey of inquiry facing herself alone and facing others to contribute to a field. It is inevitable, whether you have a BA or not. One has to be aware of how one is forming this journey by means of the vitality that is experienced. As the body-age progresses I have noticed that the need for being with my own body and in my own body is still intensely there. A particular vibration of sensing my own living body is not aging at all, on the contrary, there is a depth of the material experience that increases even. What are your discoveries regarding the age, aging and the body as the vessel of that? I first want to say that in China they say that you are becoming a good dancer at 60, so this question of age is very relative. As I age I feel the importance of being very attuned to my needs in term of practice, sleep and food – I have become more sensitive. In terms of movement, I feel that if I’m open things are there for me as a dancer and performer in general. I am still taking classes to challenge my abilities in Chi Kung and martial arts – it’s really a pleasure. I also remember seeing a Katakali master who was quite old performing when I was very young. He was sitting in this big theater and he only moved his eye following an imaginary fly throughout the space. That was it! It was amazing! So, there is so much to discover in what we can do, so many aspects and understandings of what dance is. It is necessary to look at what is vital. You work closely together with poet and architect Robert Kocik. Perhaps the usual question, but still always interesting: how difficult or easy it is to share the work and life together? Like everything, is has its advantages and difficulties. At this time we are mainly collaborating with The Commons Choir (TCC). Working with TCC is very unpredictable because we have different approaches. So, it is both challenging and inspiring and sometimes it takes over our lives. We need to continue taking care of each other and not forget that! What is your current project that you would like us to be aware of and are there some plans for the future? We recently finished our last piece with The Commons Choir in November 2017 and we are now in the process of bringing the work beyond New York City. We have begun the outline of a new work called Love Making Enemies. It is an implicate theater tracing the processes of enemy-making and turning points in violence in four separate contexts over a three-year period. We are looking to partner with peace-building and artist groups in selected geopolitical locations and create work based on risks required for breaking barriers.